Texas A&M University-Kingsville recipients shown here are Anand Nakarani and Arpit Mukul Pandya. Rajan Ahuja, CEO of SV Energy Company, handed out the scholarships. Thanks to the generosity of South Asian community, we have five Desi Foundation scholarships at TAMUCC for AY 2016-17. Dr. Mohan Rao, president of Desi Foundation, signed an agreement with Texas A&M University-Kingsville to provide scholarships to the students of South Asia. He also presented a check for $5,000 to Mr. Bradley Walker, CEO and Chief Development Officer of TAMUK Foundation. Dr. Mohan Rao, a professor at TAMUCC, awarded the first Desi Foundation Scholarship at the CBIA Independence Day program. The scholarship went to Vikas Palakurthi. Vikas Palakurthi's blind father runs a seed and pesticide shop in Telangana, India. Years of saving and the business have fueled the 23-year-old Texas A&M University-Corpus Christi's tuition since he moved to the country last year. The Mary and Jeff Bell Library recently sold canvas prints in an exhibit entitled “Europe Through My Lens” by Dr. Mohan Rao. Proceeds from each print sold, went on to benefit the Desi Scholarship Fund. The collection of prints showcases around 20 prints taken by Rao, a business professor at Texas A&M University-Corpus Christi, while on vacation in Europe. In addition, the exhibition features two prints of the Texas A&M University-Corpus Christi campus. What: This canvas print exhibition will showcase photography by Mohan Rao. Canvas prints will be for sale and all proceeds will benefit the Desi Foundation Scholarship Fund. CORPUS CHRISTI, Texas – Dr. Mohan Rao, a business professor at Texas A&M University-Corpus Christi, is using his passion for photography to raise money to support a student scholarship fund. Rao, Associate Professor of Decision Sciences, will present an exhibition of approximately 20 photographs taken while on vacation in Europe. Proceeds from the sale of each print will benefit the Desi Foundation, a scholarship fund that Rao founded. 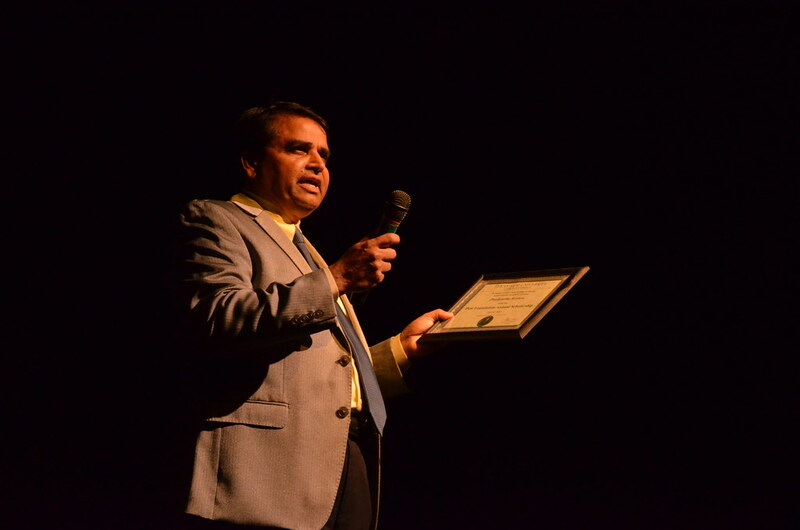 During a dance intermission, Dr. Mohan Rao, Associate Professor in the College of Business, made a presentation to the audience about the Desi Foundation Scholarship, which benefits international students. He urged the audience to consider funding the scholarship in amounts as modest as $1,000.